Regular readers (welcome - you know who you are) will be all too aware that I am bordering on fanatical about all things Apple, with my iPhone being on par with my Brompton for the daily joy it brings. There have however been a few problems. Like many of you I strive for a good work, life balance and when I go home (within reason) I like to leave my work behind. All too often however my iPhone provides emails from work or worse still phone calls from colleagues at work. Added to this is the fact that my calendar app has all my work entries. Yes I know I can easily hide these and turn the phone off, but I love the iPhone for all the other things you can do on it. Fun things. It struck me I needed another phone and I knew exactly what I wanted. I knew it had to be a BlackBerry. Many have a physical keyboard and of course they have the best email delivery system in the game. Press send and your emails magically appear on your BlackBerry almost instantly. Added to this, they have a very good calendar. I didn't want a new phone on a contract so I managed to buy a second hand unlocked Bold 9000 that was in mint condition for not too much at all. A free BlackBerry sim from the lovely people at T-Mobile gave me the BlackBerry email service and internet access for 6 months! The Bold 9000 is not the latest phone but it has a wonderful screen and the best physical keyboard of any phone I have ever used. It is a bit of a beast in terms of its sheer size, but you have seen a picture of my shoes which surely indicates that I am not the height of Tom Cruise. I have written some lengthy emails with ease on the Bold and the fact I receive them instantly on the BlackBerry, means I can respond to them all that quicker. 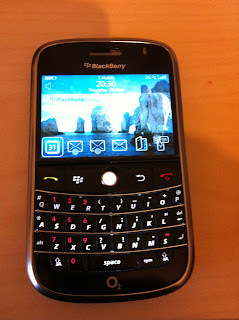 BlackBerry Bold 9000 - a brilliant phone! I now have the best of both worlds. I know that only work emails, texts and calendar entries will come on the BlackBerry. This, for me is a welcome change and already it is working out pretty well. For those of you out there in a similar situation to me, I can wholeheartedly recommend one.